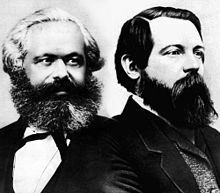 Tha Am Manifesto Comannach (neo Manifesto a' Phàrtaidh Chomannaich mar a bha air an toiseach) na bhileag phoileataigach a chaidh fhoillseachadh ann an 1848 leis na feallsanaichean Gearmailteach Karl Marx agus Friedrich Engels. Dh’earb An Lìog Comannach orra am Manifesto a sgrìobhadh, agus chaidh a fhoillseachadh an toiseach ann an Lunnainn (ann an Gearmailtis mar Manifest der kommunistischen Partei) aig an aon àm 's a bha na rèabhlaidean de 1848 ag èirigh. Thathas a-nist a' coimhead air a' Manifesto mar fear dhen na sgrìobhainnean poileataigeach nas motha san t-saoghal. Tha e a’ cur adhart mion-sgrùdadh air strì nan clasaichean (ann an eachdraidh agus anns an latha a chaidh a sgrìobhadh) agus air na trioblaidean aig calpachd agus modh-saorachaidh calpachd. Chan eil e a’ cur adhart beachd air an cruth a dh’fhaodadh a bhith air sòisealtas comannach anns an àm ri teachd. Tha am Manifesto mar gheàrr-chunntas air na teòirigean aig Marx agus Engels air sòisealtas agus poileataigs. Anns na faclan aca fhèin, "’S e na tha ann an eachdraidh nan sòisealtasan uile suas gus an latha an-diugh, eachdraidh strì nan clasaichean." Tha e cuideachd a’ toirt sùil gu sgiobalta air na beachdan aca, air mar a thigeadh sòisealachd, agus an uairsin comannachd, an àite calpachd. Tha Am Manifesto Comannach ann an ceithir roinnean le ro-ràdh. Tha an roinn mu dheireadh mar cho-dhùnadh. Tha an ro-ràdh a’ tòiseachadh le rabhadh, "Tha taibhse a’ tathaich air an Roinn-Eòrpa - taibhse chomannachd. Tha a h-uile cumhachd anns an seann Roinn-Eòrpa air tighinn còmhla ann an co-bhanntachd nèamhach, gus cuidhteas fhaighinn dhen taibhse seo." A' sònrachadh an dòigh sa tha pàrtaidhean anns gach àite - na feadhainn a tha a' riaghladh agus na feadhainn nach eil - a' toirt "slaic an ainm comannach" air a’ chèile, tha na h-ùghdaran a’ tomhas gu bheil na seann ùghdarrasan a' coimhead air comannachd mar chumhachd anns an t-saoghal. Mar sin, tha an ro-ràdh ag iarraidh air daoine comannach a bhith fosgailte mu dhèidhinn nam beachdan agus nan amasan aca, agus "gum bi manifesto a' phàrtaidh mar fhreagairt dhan sgeulachd chloinne seo mu dhèidhinn na taibhse chomannachd". Tha a’ chiad earran dhen Mhanifesto, "Bùrgairean agus Luchd-obrach" a’ toirt seachad dòigh-smaoineachadh corporra air eachdraidh - agus sin a’ ciallachadh gu bheil "eachdraidh nan sòisealtasan uile suas gus an latha an-diugh, eachdraidh strì nan clasaichean." Chaidh na sòisealtan uile air an cur ri chèile ann an dòigh far an robh mòr-chuid beò fo smac beag-chuid. Anns an sòisealta fo chalpachd, tha na luchd-obrach a’ strì an aghaidh nam bùrgairean - na feadhainn aig a bheil sealbh air modh-saotharaichaidh an sòisealtais. Mar a thachair cheana, bhiodh an strì a’ toirt gu buil rèabhlaid a bhiodh a’ cur structair ùr air an sòisealtas, neo a bhiodh a' toirt "sgrios chumanta air na clasaichean a tha a’ strì". Tha na bùrgairean - tro "atharrachadh gun sgurr air dòighean-saotharachaidh [agus] aimhreit gun sgurr air dòighean-beatha sòisealta" - a-nist ann mar chlas-rìaghlaidh, agus iad air cuidhteas fhaighinn dhen na seann chumhachdan fiùdalach. Bidh na bùrgairean a’ gabhail brath air na luchd-obrach agus air a' chumhachd-obrach aca, gus prothaid a dhèanamh dhaibh fhèin. Ach, ann a bhith a’ dèanamh seo, tha na bùrgairean "mar fheadhainn a tha a’ cladhaich na h-uaighe aca fhèin"; thig latha nuair a bhios làn thuigse aig an luchd-obrach air an t-suidheachadh, agus thig iadsan uairsin gu cumhachd tro rèabhaid an aghaidh nam bùrgairean. Tha an dàrna earran "Luchd-obrach agus Comannaich" a' tòiseachadh le aithris air an dàimh eadar comannaich, aig a bheil tuigse air mar a tha an sòisealtas ag obair, agus an còrr dhen daoine sa chlas-obrach. Cha sheas pàrtaidh nan comannach an aghaidh phàrtaidhean nan luchd-obrach, ach bidh iad ag obair gus an toil choitcheann a thaisbeanadh, agus gus dìon a thoirt air uidhean coitcheann an luchd-obrach uile, neo-eisimeil bho nàiseantachd sam bith. Tha an earran seo an uairsin a’ toirt dìon air comannachd bho slaicean eadar-dhealaichte, nam measg gun robh comannaich an aghaidh pòsadh, agus nach biodh daoine deònach obair a dhèanamh ann an sòisealtas comannachd, leis nach biodh adhbhar ann dhaibh. Tha an earrann a' tighinn gu crìoch le liosta de phoileasaidhean eadar-amail. Nam measg, tha: cìs cosnaidh cheumnaichte; crìoch air oighreachdan, agus; foghlam poblach saor an-asgaidh. Bhiodh na poileasaidhean seo mar a' chiad cheum a dh'ionnsaigh sòisealtas a tha gun stàit agus gun chlasaichean. Tha an treas earrann, "Litreachas Sòisealach agus Comannach", a’ dèanamh sgaradh eadar comannachd agus na beachdan sòisealach eile a bha timcheall aig an àm - nam measg: Sòisealachd Ais-Cheumach; Sòisealachd Ghlèidhteachail neo Sòisealachd nam Bùrgairean; agus Sòisealachd Cheasnachail-Iutòpianach. Tha am Manifesto a' toirt dìmeas orra uile, leis nach robh iad ag aithneachadh gur e an clas-obrach an clas a bhios a’ toirt rèabhaid gu buil. Tha an earrann mu dheireadh dhen Mhanifesto, "Seasadh nan Comannach mu chomhair nam Pàrtaidhean Dùbhlanach Uile", a' bruidhinn air seasadh nam comannach air an strì a bha a' dol aig an àm ann an dùthchannan eadar-dhealaichte, mar An Fhraing, An Eilbheis, A' Phòlainn, agus A' Ghearmailt. Thathas ag ràdh gu bheil A' Ghearmailt "air oir rèabhailt nam bùrgairean", agus gum bi rèabhailt air feadh an t-saoghail as dèidh sin. Tha am Manifesto a' crìochnachadh le gairm airson co-bhanntachd le deamocrataich shòisealta, le a bhith a’ cur taic dha rèabhailtean comannach, agus le gairm airson gnìomhan aonaichte leis an luchd-obrach eadar-nàiseanta. Ann an 1850 dh'eadar-theangaich Helen MacFarlane am Manifesto gu Beurla. Air a tharraing à "https://gd.wikipedia.org/w/index.php?title=Am_Manifesto_Comannach&oldid=540184"
Chaidh an duilleag seo a dheasachadh 23 dhen t-Samhain 2017 aig 08:00 turas mu dheireadh.